In a landmark ruling, the UK Information Commissioner's Office has ruled that Queen's University Belfast must hand over data obtained during 40 years of research into 7,000 years of Irish tree rings to a City banker and part-time climate analyst, Doug Keenan. This week, the Belfast ecologist who collected most of the data, Professor Mike Baillie, described the ruling as "a staggering injustice ... We are the ones who trudged miles over bogs and fields carrying chain saws. We prepared the samples and - using quite a lot of expertise and judgment - we measured the ring patterns. Each ring pattern therefore has strong claims to be our copyright. Now, for the price of a stamp, Keenan feels he is entitled to be given all this data." Last month, the Milwaukee Journal Sentinel published two articles documenting the current state of the U.S. patent system (see "The Milwaukee Journal Sentinel Gets It Right about Patents"). 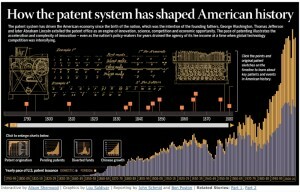 The authors of those pieces, John Schmid and Ben Poston, have now compiled an interactive graphic that shows how the U.S. patent system has shaped American history and innovation. The graphic contains a number of elements, including a timeline of key patents and significant events in American history, a comparison of domestic and foreign patents issued between 1790 and 2009, and charts showing the top countries and states in which U.S. patents originated, the number of pending applications between 1981 and 2009 and average application pendency between 1983 and 2008, fee diversion between 1992 and 2004, and rapid growth of the Chinese patent system between 1999 and 2008. Some asked me if this proved patents do encourage innovation. But of course it does not. This proves absolutely nothing, in fact, except that there can still be growth despite state intervention such as intellectual monopoly grants. Correlation is not causation. I hope Obama doesn't see this--I'm sure he could whip up a similar chart correlating growth over the last two centuries with, say, increasing taxes, increasing federal spending, increasing federal size/employment, increasing military size, increasing efficiency at mass murder, and so on. Further, note the flaw in using China to prove the patents-drive-growth hypothesis: China's economy has been growing for a good decade even though it has had and continues to have very mild and tepid IP laws. In fact, Chinese IP laws are gradually being reformed under pressure from the industrialized Western nations--no doubt to please large Western pharmaceutical, software, and other firms that stand to benefit from extending their Western-state-granted artificial monopolies to the growing Eastern economies (see my posts Russian Free Trade and Patents, IP Imperialism (Russia, Intellectual Property , and the WTO), Bush Wants More Jailed Citizens in Russia and China, and China, India like US Patent Reform). Do these intellectual monopolists really expect us to believe that China owes its recent growth to Disney and Big Pharma's lobbying efforts?! Thank God the Western White Man saves the poor benighted Yellow Eastern man. What would they do without us? Who needs capitalism and increasing institutionalized respect for property rights--if you are a third world economy and want to grow, just let America strong-arm you to adopt their type of IP laws--along with their FDA regulations, antitrust law, and IRS. Give me a break. One of the more scandalous forms of patents are patenting portions of the human genome. The BRCA1 and BRCA2 genes are known to be correlated with breast cancer in women. Unfortunately they have been patented by Myriad Genetics who take the idea of monopoly seriously - leading to a stoppage of genetic research in this area, as well as restricting access to genetic tests for breast cancer. Researchers - and women - finally got fed up with this and filed a lawsuit against the patent. You can find the complaint here. The plantiffs include the ACLU, the Association for Molecular Pathology, The American College of Medical Genetics, The American Society for Clinical Pathology, the College of American Pathologists and a number of individual researchers and women. Steve Silberstein draws our attention to The New York Times coverage. In light of empirical evidence that patents do little to encourage or discourage innovation, I'm sometimes asked - why should we get rid of them? They don't seem to do any harm. If you'd like to see what harm they do, read the complaint. Crop Scientists Say Biotechnology Seed Companies Are Thwarting Research. This excellent New York Times article describes how the licenses for GE seeds are preventing scientists from studying them. Pollack, Andrew. 2009. "Crop Scientists Say Biotechnology Seed Companies Are Thwarting Research." New York Times (19 February). "Biotechnology companies are keeping university scientists from fully researching the effectiveness and environmental impact of the industry's genetically modified crops, according to an unusual complaint issued by a group of those scientists. "No truly independent research can be legally conducted on many critical questions," the scientists wrote in a statement submitted to the Environmental Protection Agency. The E.P.A. is seeking public comments for scientific meetings it will hold next week on biotech crops." "The researchers, 26 corn-insect specialists, withheld their names because they feared being cut off from research by the companies. But several of them agreed in interviews to have their names used. The problem, the scientists say, is that farmers and other buyers of genetically engineered seeds have to sign an agreement meant to ensure that growers honor company patent rights and environmental regulations. But the agreements also prohibit growing the crops for research purposes. So while university scientists can freely buy pesticides or conventional seeds for their research, they cannot do that with genetically engineered seeds. Instead, they must seek permission from the seed companies. And sometimes that permission is denied or the company insists on reviewing any findings before they can be published, they say. Such agreements have long been a problem, the scientists said, but they are going public now because frustration has been building. "If a company can control the research that appears in the public domain, they can reduce the potential negatives that can come out of any research," said Ken Ostlie, an entomologist at the University of Minnesota, who was one of the scientists who had signed the statement." "The companies "have the potential to launder the data, the information that is submitted to E.P.A.," said Elson J. Shields, a professor of entomology at Cornell." "The growers' agreement from Syngenta not only prohibits research in general but specifically says a seed buyer cannot compare Syngenta's product with any rival crop. Dr. Ostlie, at the University of Minnesota, said he had permission from three companies in 2007 to compare how well their insect-resistant corn varieties fared against the rootworms found in his state. But in 2008, Syngenta, one of the three companies, withdrew its permission and the study had to stop. "The company just decided it was not in its best interest to let it continue," Dr. Ostlie said." "Mark A. Boetel, associate professor of entomology at North Dakota State University, said that before genetically engineered sugar beet seeds were sold to farmers for the first time last year, he wanted to test how the crop would react to an insecticide treatment. But the university could not come to an agreement with the companies responsible, Monsanto and Syngenta, over publishing and intellectual property rights. Chris DiFonzo, an entomologist at Michigan State University, said that when she conducted surveys of insects, she avoided fields with transgenic crops because her presence would put the farmer in violation of the grower's agreement." "Dr. Shields of Cornell said financing for agricultural research had gradually shifted from the public sector to the private sector. That makes many scientists at universities dependent on financing or technical cooperation from the big seed companies. "People are afraid of being blacklisted," he said. "If your sole job is to work on corn insects and you need the latest corn varieties and the companies decide not to give it to you, you can't do your job"."